Last week, I received a sweet little package from Rick at OMUNKY. Its contents? The latest OMUNKY design, “Tiger Turmoil” plus some stickers! Needless to say, I was ecstatic to start off the Year of the Tiger with a hilarious tiger tee. I may have already said it in some earlier post, but let me reiterate that I’m a huge fan of wild cats. Huge fan! I haven’t gotten the chance to wear this shirt out and about yet, but I already got some compliments when I first took it out of the package. I did, however, wash it and now it is ready to be reviewed here at Loving This Tee. To start things off, the print is a great size. The design is not too big and it’s not so small that people have to be standing a foot away to see what’s really going on. When I think of tigers, I see ferocious beasts that are scared of nothing. 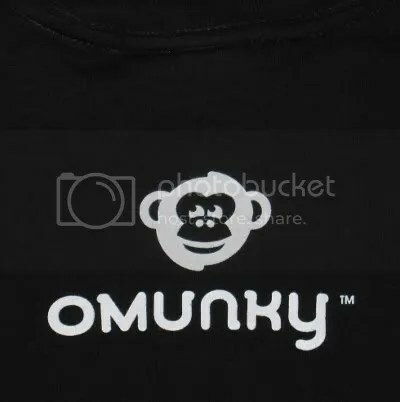 OMUNKY has taken the tiger’s tough reputation and spun it 180 degrees. Now instead of scaring the little bug away, the tiger is wigging out and wondering what to do. With that said, the design gets two thumbs up from me! 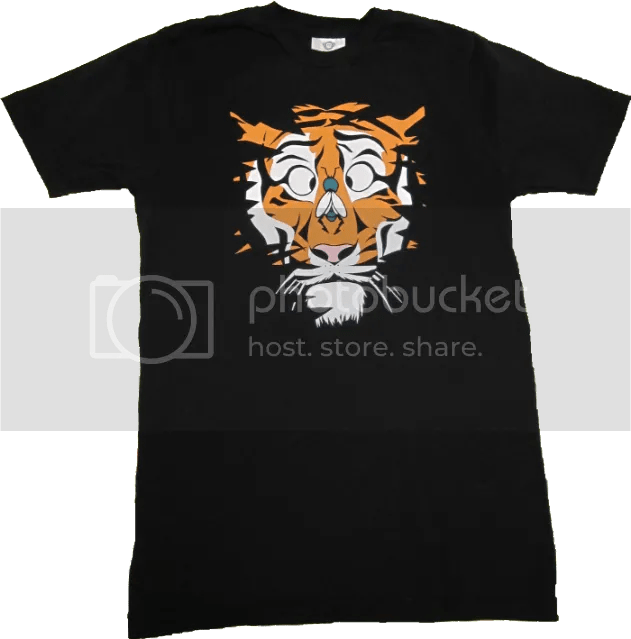 “Tiger Turmoil” is printed on a 100% certified organic cotton tee and it comes with a custom care tag and a printed logo on the back. 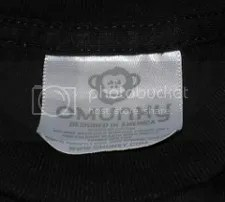 The tag is wider than what I’m used to in other t-shirts, and I sometimes notice it moving around when I’m standing up. I’m quite sensitive to any itch-inducing features in shirts, and when my body is at a certain angle, I definitely feel the tag’s sharp edges. Because the tag likes to curl, I think that I will have to cut it out to avoid future irritation. You may not have this problem, though. Like I said, I am very sensitive to this stuff. The organic tee is very soft, and that’s all that truly matters in the grand scheme of things. Bonus points for that. Now onto the printing! I absolutely love the look and feel of this shirt. After a cycle in the washing machine, the ink remained as vivid as when the t-shirt had just arrived. 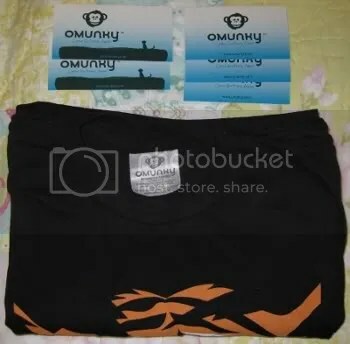 Prior to seeing an OMUNKY tee in person, I’ll admit that I was scared about the ink being thick and chunky in order to achieve some of the colors on a dark t-shirt. Boy, was I wrong. You can definitely feel the ink when you rub your hand over the print, but it’s a very thin layer of ink that’s nice and flexible. I am quite impressed with the quality of the printing! 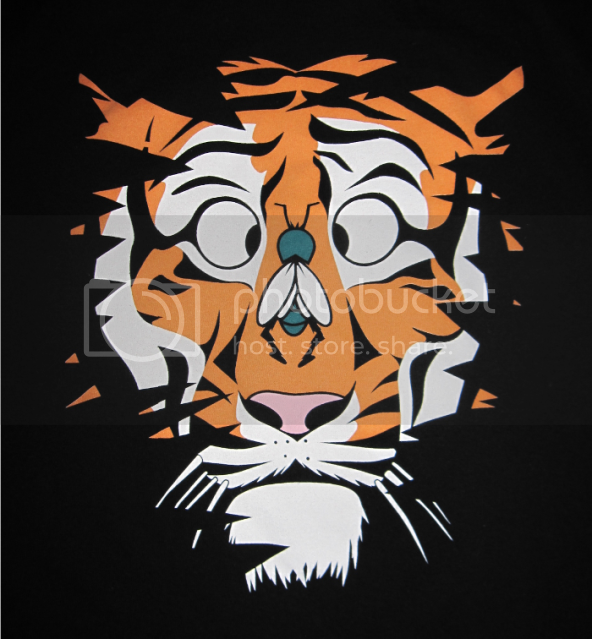 You can purchase your very own “Tiger Turmoil” t-shirt at OMUNKY for $22 and save 15% with the code LOVINGTHISTEE! 5% of the proceeds from this t-shirt will be donated to WildAid. Also, be sure to check out the sweet package deals that are up in the shop. OMUNKY has been doing a great job with releasing better and better designs every month, and I am now very excited to see what next month’s drop will be! 3 Responses to "This Just In! 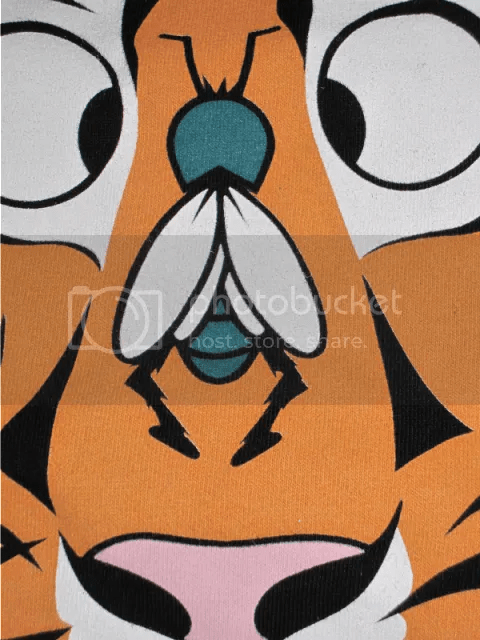 : Tiger Turmoil by OMUNKY"
Glad you shared the info about the ink on the tee … you never know when you order something online if it’s going to come out like you’re wanting it to, especially after a wash. Great stuff! No problem! That’s why I like to wash tees first, just so that I’m reviewing what I’ll actually be wearing. Tees can look great out of the package, but if they can’t hold up to washing, then what’s the point?